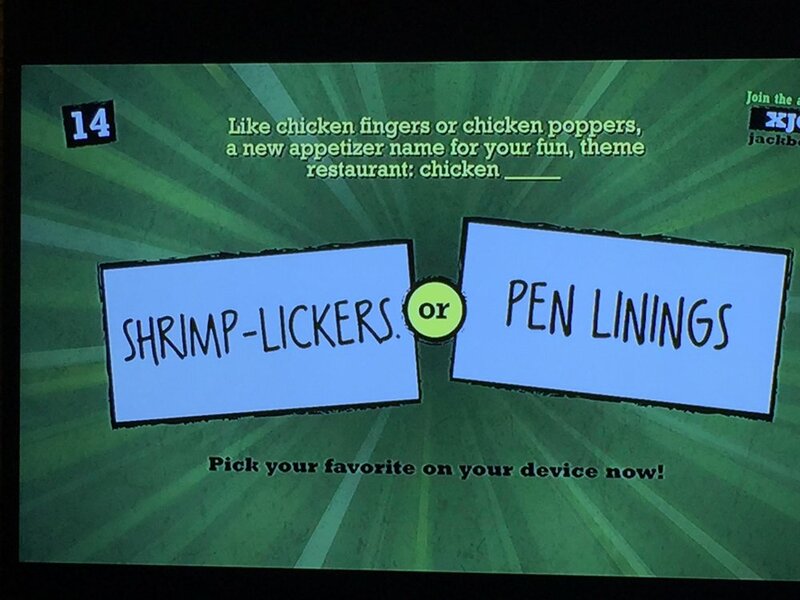 #365Gratitude Day 253:Shrimp-lickers or pen linings? — No starting. No stopping. Only doing. #365Gratitude Day 253:Shrimp-lickers or pen linings? On Friday I had a moment of mad scientist frenzy. I had stumbled across this electronic party game called QuipLash and what u wanted more than any other thing was to play it across the Internet with friends. The game is meant to be played by a large number of people in the same room, each using their smartphone or tablet as a controller. As for the game, it's like putting Cards Against Humanity and The Game of Things in a blender, mixed with a dash of fart jokes and crude flirty behavior. Using my xbox, twitch, and my laptop I worked out a way to get a bunch of nice folks from the Big Little Podcast slack to play. Which resulted in choices like that delightful one. So fun!